Well Happy 30th Wayne! Wayne´s birthday didn´t exactly go to planas he had to spend all day travelling from Kuala Lumpar to here! We finally arrived at our resort at 8pm and I had booked us into Berjaya´s 5* resort as a treat for Wayne. Unfortuately the resort was a big disappointment the staff were absolutely appaling! 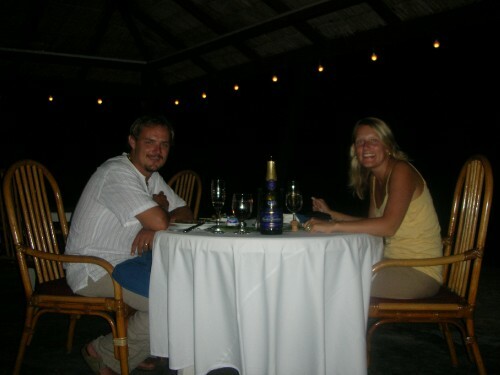 That night we went for dinner at the only restaurant still open and ordered a drink, a starter and a main course. They brought everything to the table at once within about 15 mins, so you can imagine the quality of the food and how thirsty we were by then! So we decided to forget that day as Wayne´s birthday! We decided to get out of the resort and hire a bike. Far too many hills though I spent more time off the bike pushing it up a hill! A very small little village with nice, smiley people so we then spent most of our time out of the resort as we refused to spend anymore money in there! Wayne went out fishing one afternoon and caught loads of fish but he had to cut it short due to a storm coming. He kept 3 snappers to bring back for me to have for dinner! (Have a look at the pictures)!